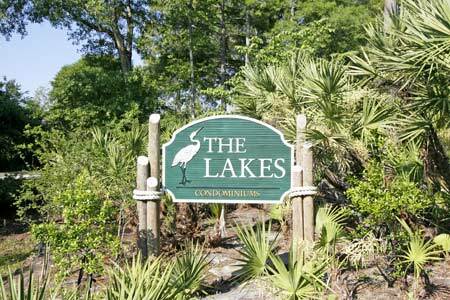 The Lakes condominiums in Jacksonville, Florida. The Lakes is a condominium community located in Southside area. Adding to the appeal of Baymeadows is the convenient location, just 5 minutes to premier shopping and dining, 10 minutes to downtown Jacksonville and 15 minutes to the Beaches. The Lakes is within walking distance from grocery stores, restaurants, public transportation, and several other local businesses. Built in 1973, The Lakes features 153 condo residences situated on 43 acres of lush preserves and Lake Tahoe. Homes ranging in size from 1,501 to 2,198 square feet featuring 2 and 3-bedrooms condo with assigned parking. Resort-style amenities include clubhouse, swimming pool, two maintained tennis courts, shuffleboard, basketball courts, children's playground, a locked boat and RV storage lot. The community has easy access to Interstate I-95, downtown, beaches, schools, shoppings, fine dining restaurants, movies, banks, and doctors' offices. Condo fees include water and sewer.